There is no need to FIX anything or to CHANGE anything in order to shrink our social margins. 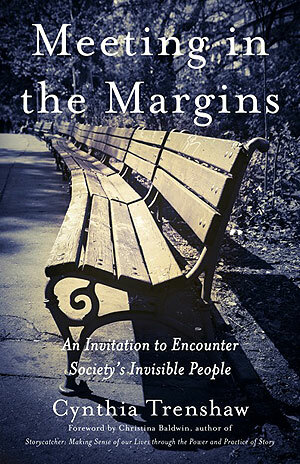 What is needed is simply to BE WITH, to risk crossing into the margins to encounter the “invisible people,” one fragile human seeing and listening to another. Cynthia was recently interviewed on the Booklovers' Cafe feature on KPTZ-FM radio. Cris Wilson talks with her about poetry and street-level outreach of a very different style. To arrange an interview with Cynthia Trenshaw or arrange for a performance, book reading, lecture, or workshop, please contact Cynthia at cynthia@cynthiatrenshaw.com or call her at 360-331-3213. Selections from Meeting in the Margins have been chosen for the collection Pain and Memory published by Editions Bibliotekos, Inc.
Do we help or do we serve? Serve or Help? Success or Failure?